The ArtSalon goes to Holyoke, May 28th! This month’s ArtSalon will be at Gateway City Arts in Holyoke. The evening begins at 6:30pm and presentations start at 7:30pm. Holyoke Hummus Company is at Gateway City Arts on Thursdays 11am-7pm, so we encourage people to come early and and have dinner before the event! There will also be a cash bar with proceeds going to support Gateway City Arts. Vitek Kruta (born in Prague, Czech Republic) is a professional artist, muralist, art restorer, designer and teacher. 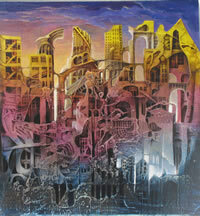 His work has been featured in exhibitions in former Czechoslovakia, France, Germany, United States and Canada. Mr. Kruta was trained in Old-World techniques of Fine and Decorative Arts in Czech Republic and Germany, where he attended schools and worked as restorer of historical buildings, castles and churches before coming to the United States in 1991. Since his arrival to USA, Mr. Kruta continues his carrier as freelance artist, designer and art restorer, teacher, instructor and consultant for various public and not for profit organizations and groups, schools and business associates. He resides currently in Holyoke, is the co-owner of Gateway City Arts. Dean Nimmer has exhibited his art in over 200 solo and group exhibitions across the U.S. and in Europe, Asia, and Australia. His artworks are in the collections of the Boston Museum of Fine Arts, DeCordova Art Museum, Smith College Art Museum, Harvard University art collection and many other museums across the country and abroad. He is the author of the successful book, Art from Intuition, (Watson-Guptill/Random House, 2008), that is currently in its 6th printing, and his new book, Creating Abstract Art, (North Light Books, 2014) is one of the highest rated and best selling books on art across the country. 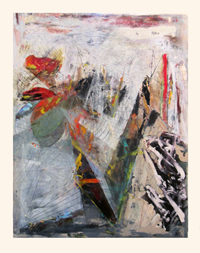 Dean is also Emeritus Professor and the former Chairman of the Painting and Printmaking programs at Mass College of Art. Lisa Hersey is a printer and book binder working out of Holyoke. She runs Antler Editions, a small editions book bindery and print shop out of her studio which is part of Brick Coworkshop. Printing in both letterpress and silk screening Antler Editions creates posters, books, zines, packaging and more. 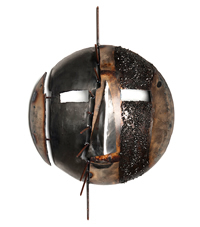 Kamil Peters is a contemporary metal artist working out of Holyoke, with roots in Texas and Western Massachusetts. His work embodies a wide range of intricate masks to large-scale commercial installations. Over time he’s become very deliberate with his intentions to incorporate the spirit of the past with a distinct modern edge as an interpretation of the natural world; allowing his environment to play a key role in how his work is expressed. This ArtSalon is made possible in part by support from Florence Savings Bank, The Community Foundation, and Sandy and Mary Dibble.